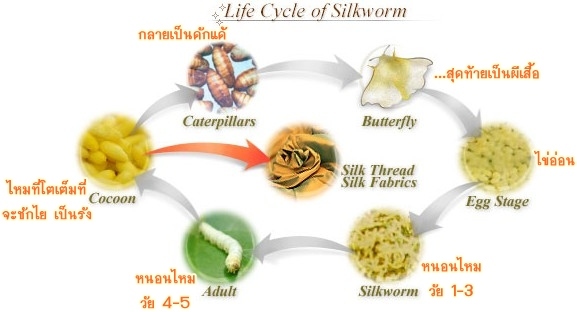 The life cycle of silkworm before a butterfly the eggs develop into the silkworm. They eat for 20-30 days, consuming large amounts of mulberry leaves. The silkworm spins a cocoon for protection, to permit the development of the pupa or chrysalis. The cocoon takes about three days to be fully complete and is a similar size to a peanut shell. 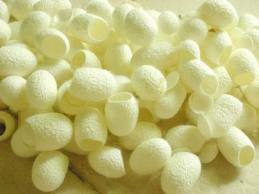 As a results from past researches find that silk cocoon has properties that are beneficial to human skin in that it acts as skin moisturizer as much as 300 times of its weight. The protein contains about 16 -18 types of Amino acid which are antioxidants with substances that kill certain types of microorganism of skin disease cause. Moreover, protein from cocoon also helps eliminate toxics in skin cells; thus reduces skin inflammation, accelerates wound healing and erases wrinkles. Furthermore, it is found that protein obtained from cocoon enables cells to build collagen and elastin , which play a key role in revitalizing and boosting skin to have a flexible and moisturized look in older ages.